Waterproofing admixtures are added to concrete structures to reduce their permeability and make them waterproof, with the objective of providing superior protection. They thus enhance the durability of structures and enhance the overall maintenance process. The drive for waterproofing admixtures in the construction industry stems from the need for improving the compressive strength and the durability of concrete. The rising use of waterproofing admixtures in addressing the various concrete durability issues in old as well as new construction structures is a key factor propelling the growth of the market. Key properties which make their use relevant in such applications are water reduction, increased hydrophobic effect, splendid pore reduction and blocking, and increased density. Understanding the mechanics of physical and chemical degradation, due to water and ingress of fluid, paves way to product launches and innovations in the global waterproofing admixtures market. 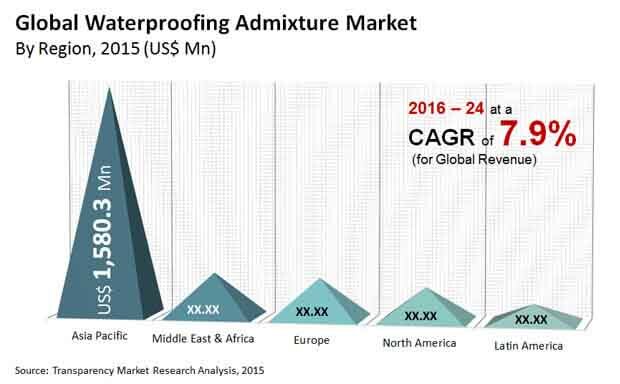 The global waterproofing admixtures market stood at US$2.5 bn in 2015 and is projected to rise at CAGR of 7.9% during the forecast period of 2016–2024. By 2024 end, the opportunities in the global market are anticipated to reach US$4.9 bn. On the basis of product type, the report segments the global waterproofing admixtures market into pore-blocking, crystalline, and an others category notably including supplementary cementitious material. Of all the segments, the crystalline one is expected to hold sway in the global waterproofing admixtures market. By the end of 2024, crystalline waterproofing admixtures are anticipated to contribute a share of 46.7%. They have earned their name as the primary admixture and are largely hydrophilic. Their unique characteristic of filling even minor cracks in concretes stem from their self-healing abilities, which come from the mix of proprietary active chemicals and cementitious material. The other key segment pore-blocking admixtures have emerged as secondary admixtures. They act by forming an insoluble hydrophobic layer on concrete and hence stop the water to permeate through it. This product type falls under the PRA category of Permeability-Reducing Admixture for Non-hydrostatic conditions (PRAN). Water-repelling chemicals in pore-blocking admixtures consists notably of mineral oil, stearates, and long chain fatty acids derivatives. Vis-à-vis application, the global waterproofing admixtures market is segmented into commercial, infrastructure, and residential sectors. The residential application is projected to serve the major demand in the market. The prominence can be attributed to the rapidly rising demand for various types of waterproofing admixtures in old and new residential projects. The rapid strides made by the housing sector, especially in emerging economies, are bolstering the demand for waterproofing admixtures. This is supported by the swift pace of urbanization in various regions across the globe. Crystalline products have witnessed higher application owing to their attractive characteristics in managing hydrostatic pressure. The various key regional markets for waterproofing admixtures are Asia Pacific, North America, Europe, the Middle East and Africa, and Latin America. Of these, Asia Pacific holds the major share and is likely to retain its lead throughout the assessment period. Rapid strides made in the construction sector, notably in countries such as China and India. On the other hand, the rising popularity of multidwelling units in the Middle East and Africa will help the regional market to rise at promising pace over the assessment period. Meanwhile, the demand for waterproofing admixtures in North America and Europe has matured a bit over the past few years. Especially, North America witnessed a decline in uptake in 2015. Factors constraining demand are the implementation of governmental regulations pertaining to VOC emission and rise in consumer awareness regarding waterproofing admixtures. However, the demand in Europe has received a massive impetus from the growing prospect of high-performance concrete structures in the regional residential sector. Some of the key players operating in the waterproofing admixture market are Mapei SPA, Cemex, Sika AG, and BASF SE. Waterproofing admixture is a porous chemical ingredient employed during cement or concrete formulation to resist water penetration and water-borne contaminants. Waterproofing admixture is primarily used in residential, commercial, and infrastructure sector. Concrete being sustainable building material can reduce carbon footprint by 30-40%, but being porous in nature it is susceptible to chemical attack. Thus, waterproofing admixtures if employed during formulation provides excellent resistance to alkali attack during climate and weather changes. It also reduces maintenance cost and enhances the durability of concrete structures. The report estimates and forecasts the waterproofing admixture market on the global, regional, and country levels. The study provides forecast between 2016 and 2024 based on volume (KiloKilo Tons) and revenue (US$ Bn) with 2015 as the base year. The report comprises an exhaustive value chain analysis for each of the product segments. It provides a comprehensive view of the market. Value chain analysis also offers detailed information about value addition at each stage. The study includes drivers and restraints for the waterproofing admixture market along with their impact on demand during the forecast period. The study also provides key market indicators affecting the growth of the market. The report analyzes opportunities in the waterproofing admixture market on the global and regional level. Drivers, restraints, and opportunities mentioned in the report are justified through quantitative and qualitative data. These have been verified through primary and secondary resources. Furthermore, the report analyzes global average price trend analysis of waterproofing admixture. The study provides a comprehensive view of the Waterproofing Admixture market by dividing it into product type, application and geography. The waterproofing admixture market has been segmented into crystalline, pore-blocking, and others. Application segments have been analyzed based on historic, present, and future trends, and the market has been estimated in terms of volume (Kilo Kilo Tons) and revenue (US$ Bn) between 2016 and 2024. The report includes Porter’s Five Forces Model to determine the degree of competition in the waterproofing admixture market. The report comprises a qualitative write-up on market attractiveness analysis, wherein application and countries have been analyzed based on attractiveness for each region. Growth rate, market size, raw material availability, profit margin, impact strength, technology, competition, and other factors (such as environmental and legal) have been evaluated in order to derive the general attractiveness of the market. The report comprises price trend analysis for Waterproofing Admixture between 2016 and 2024. The report covers detailed competitive outlook that includes market share and profiles of key players operating in the global market. Key players profiled in the report include CEMEX S.A.B. de C.V.,BASF SE, Sika AG, Wacker Chemi AG, Mapei S.P.A. Company profiles include attributes such as company overview, number of employees, brand overview, key competitors, business overview, business strategies, recent/key developments, acquisitions, and financial overview (wherever applicable).